What Is Environment, Health and Safety (EHS) Management? Today, Environment, Health & Safety (EHS) programs are so prevalent across global manufacturing organizations, at first thought, providing a definition can feel redundant and unnecessary. However, in the midst of emerging best practices, shiny new tools and technologies, and a plethora of metrics to capture and analyze events and actions, it can be easy to forget what EHS actually is as well as how and why it emerged. In understanding the space, a little bit of history is helpful. It’s important to know that there’s a difference between what EHS was and what it has become today. In tandem with the launch of our EHS Library, in this post we’ll define LNS Research’s notion of what EHS management means, provide an overview of how the definition of the space has evolved in recent decades, and discuss where we see it going in the future. 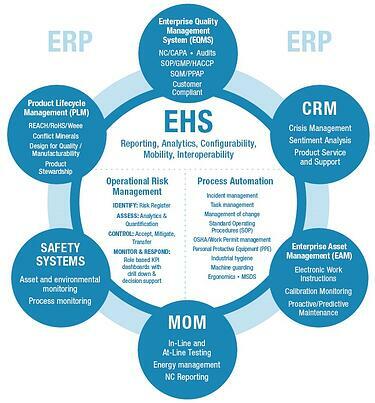 At a high level, EHS management encapsulates the use of end-to-end business processes and requirements that are designed to systematically achieve continuous improvement in EHS performance. These processes reflect the role of EHS performance in the larger overall goals of sustainability performance and operational excellence, taking into account the planning, processes, procedures, and implementation of EHS initiatives. In turn, these directives should be rooted in an established methodology designed to achieve performance, evaluate results, and provide mechanisms for acting on recommended actions. While there are other concepts and specifics that can fall under EHS management, the above is a compendium of what LNS Research sees as the EHS management space and its function within a manufacturing operation. From a worker standpoint, the transition from agricultural to industrial society was marked in large part by automated production and large, potentially dangerous machinery. The evolution of these conditions gave rise to increasingly severe worker health and safety catastrophes, giving birth to formalized safety programs and procedures which were the beginnings of what we think of today as EHS management. Silent Spring: Written by marine biologist and conservationist Rachel Carson and published in 1962, this book is considered a seminal work in environmentalism and helped spur a reversal of U.S. national pesticide policy, as well as the movement that would lead to the creation of the Environmental Protection Agency (EPA). The Bhopal Disaster: In India in 1984, an accidental gas leak at a Union Carbide pesticide plant exposed over a half million people to toxic gases and other chemicals, culminating in a death toll debated at between 3,700 and 16,000, and many, many more injuries and illnesses documented over the years. The extent and severity of the disaster was a wake-up call to large industry on the need to move past manual, paper-based systems that were failure-prone and overly dependent on human organization and inputs. As mentioned above, the light shone on the potential effects of industry by environmental champions like Carson and others, and public outrage over health and safety incidents like Bhopal, contributed to the creation of federal oversight agencies such as the EPA and the Occupational Safety and Health Administration (OSHA) in the U.S., as well as counterparts abroad. These agencies sought to clamp down on the loss of life, worker injuries, and undue environmental impacts associated with industry. Within the internal EHS sphere, like other operational areas, EHS management has changed dramatically with the development of technology resources. While its existence as a corporate activity has been around for decades, it has only been since the turn of the most recent century that we’ve begun to see the convergence of finely tuned and widely adopted EHS management process frameworks and management standards, improved Web-based EHS management software, and a better understanding of corporate culture’s role in boosting EHS performance. Another important factor in this is the increased public expectation of Corporate Social Responsibility (CSR) on the part of global enterprise, which has grown from the aforementioned worker/environmental examples into the present day. Whereas EHS management in the past could be considered primarily motivated by the proverbial stick, today’s companies are really starting to see the carrot come into the picture. Market leaders are seeing that EHS performance has an inseparable tie to bottom-line performance, and have begun to view it no longer as a collection of independent programs isolated from other management programs across the enterprise. Indeed, the advancing technical trends of the past 15 or so years, with Web-based systems and real-time transactions, have allowed companies to view EHS management at a much more immediate and detailed level, shifting decision making from reactive to proactive over time. Since overall, we see EHS management as being increasingly important strategically to companies’ bottom lines, we believe the next generation of EHS management will integrate tightly with other areas of the business. Part of what LNS Research sees for next-generation EHS management includes increased integration with other software systems such as ERP to better streamline it and further incorporate it into overall sustainability management. Additionally, as the promise of the Internet of Things (IoT), Big Data, mobile capabilities, and tech wearables begin to provide increasing amounts of actionable and predictive analytics, the linkage these overall business systems such as Business Intelligence (BI), Enterprise Manufacturing Intelligence (EMI), Enterprise Quality Management Software (EQMS), and Manufacturing Operations Management (MOM) will become increasingly apparent.